There are about forty species of birch, growing in widespread habitats from the sides of streams and rivers to forest boundaries and open fields. They are one of the oldest known trees, with leaf imprints found from the Late Cretaceous period, which ended about 67 million years ago. These living fossils are wind-pollinated and tend to colonize quickly, particularly in disturbed areas, creating beautiful stands with trees reaching heights of 60-80 feet. They typically enjoy a lot of water, making them a good choice for rain gardens or landscaping for natural stream restoration projects. They are so attractive that they can easily serve as a specimen in a front yard or formal landscape, their small leaves turning brilliant yellow in the fall and blowing away in autumn breezes, creating less of a maintenance chore of leaf collection than some larger-leafed species. Their graceful trunks and branching structure can be stunning focal points when illuminated from below by landscape lights, particularly in the winter when their “bones” are easy to see. Birch belong to the genus Betulacea, along with alders, willows and hornbeams. 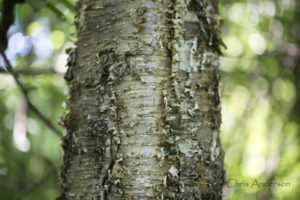 Common names for birch come in a number of colors: white birch, black birch, gray birch, silver birch and yellow birch; each distinguished by certain characteristics, often by how their bark naturally peels from the tree. Yellow birch (Betula alleghaniensis) bark is silvery bronze at maturity and peels in small, papery pieces. The peeling occurs when lenticels, the dark horizontal lines in the bark, stretch due to the tree’s growth and then peel up and away from the trunk. 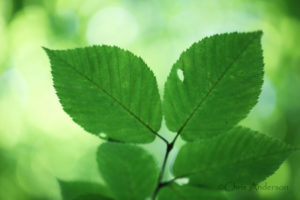 Lenticels serve an important function by allowing air and gas exchange between the atmosphere and the tree’s internal tissues. Yellow birch is the most important birch species commercially, used for fine furniture and woodturning, as it is strong and develops a smooth and satiny finish. 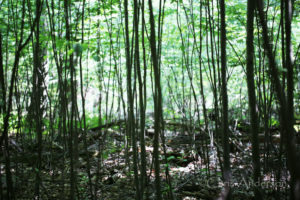 One location to admire yellow birch is along the Limberlost trail in Shenandoah National Park. At 1029m (3,377 ft) elevation, the birch grow happily along the trail. The area tells the tale of a quickly-changing forest as the birch are growing prolifically following the mighty hemlocks that have succumbed to the invasive non-native hemlock woolly adelgid. The hemlocks’ demise open up opportunities for the birch to fill the void. Native American Indians possessed in the past and practice of the uses of native plants. The birch is a valuable survival food and was utilized by indigenous people during starving times. The ground bark of the birch when mixed with flour may support life when other food is unavailable. 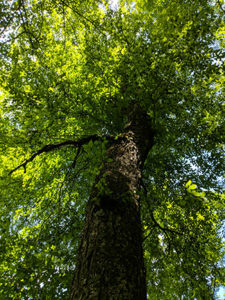 ‘A Jesuit missionary noted that the bark of oak, birch, linden, and that of other trees, when well cooked and pounded, and then put into the water in which fish had been boiled, or else mixed with fish-oil made some excellent stews’ notes Horace Kephart in a 1917 version of Camping and Woodcraft. Native peoples have long made use of birch bark for canoes and storage containers, tapping for syrup in the spring, enjoying the twigs which have a wintergreen taste (found in both yellow birch and sweet birch), making birch tea and utilizing the paper-like bark to start fires, even after rains, due to volatile resins in the outer layer. 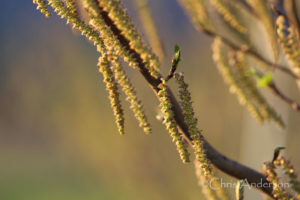 Euell Gibbons, wild plant expert, notes that sweet birch (Betula lenta) sap flows about one month after maples and that the sap can be consumed straight from the tree and ‘tastes more like spring water than anything else, but it has a faint sweetness and a bare hint of wintergreen flavor and aroma’. He also provides directions on how to make birch beer by boiling honey and birch sap, pouring it over finely chopped sweet birch twigs and letting it ferment with the help of a little yeast. He cautions consuming it with restraint as it has a ‘kick like a mule’ (Gibbons, 34). The bark allows hiding spaces for many insects over the winter, treats which woodpeckers enjoy ferreting out. Birds eat the seeds in the winter and the foliage supports several hundred species of moths and butterflies. 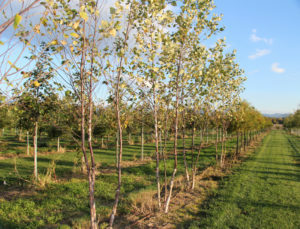 In conclusion, for an attractive and valuable native tree in all four seasons, consider the yellow birch or planting a stand for increased wildlife benefit. They can live 150 years and maybe up to 300 years in old growth forests. Horace Kephart, Camping and Woodcraft (New York: The MacMillan Company, 1917) p. 420. Euell Gibbons, Stalking the Wild Asparagus (New York: David McKay Company, 1962), p.34. Douglas Tallamy, Bringing Nature Home (Portland: Timber Press, 2007), p. 163. This entry was posted in News by Chris Anderson. Bookmark the permalink. Copyright © 2013-2019 White House Natives, LLC. All Rights Reserved.